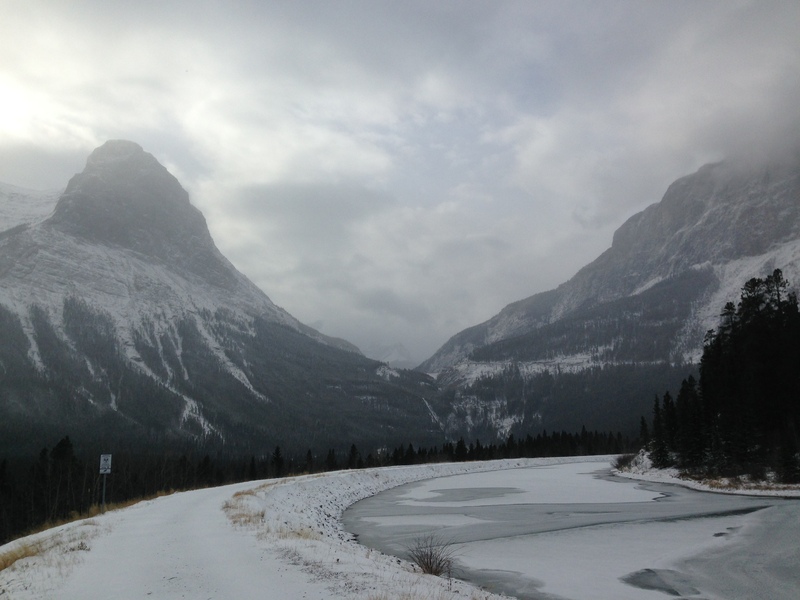 One of the big adjustments i’ve had to make running in Canmore is running in the cold and snow. And I mean really, really, really cold and very, very snowy compared to what i’m used to. 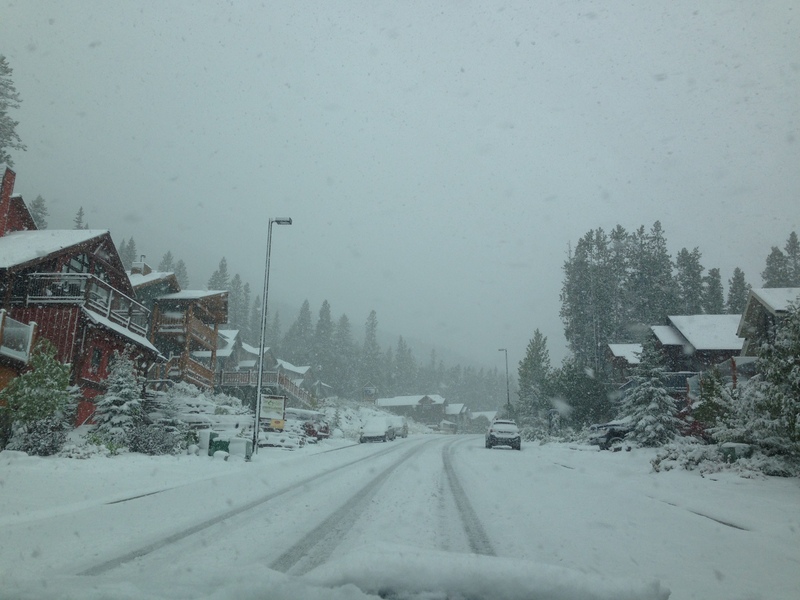 But within a week the snow had all but disappeared, the weather warmed up and it was all very pleasant into October. And then November rolled around. I’m no stranger to running in winter. I’ve always prided myself on running all year round regardless of the weather. In New York, which can be pretty nasty in terms of cold weather, I would feel this silly sense of superiority as I ran home from the office along a dark, icy, windswept East River bike path, very much alone, unlike during the summer months when you couldn’t move for runners. And in Geneva too, winter was not the time to hide indoors, not least because the average temperatures rarely went drastically south of zero and the climate tended to be more damp than snowy and icy. Ha Ling Peak and Whitemans Gap. This was, for me, a whole new level of cold that i’d not previously encountered. It was going to require a whole new set of gear, I mean some careful reflection about what running in these kinds of temperatures entails. There’s no shortage of sensible and useful tips and advice out there (i.e., on the internet) on winter running. And this is a good thing, not least because it reinforces the message that you don’t hang up your running shoes once the snow starts to fall or the temperatures plummet. I should mention that the temperature here goes up and down like a yoyo. 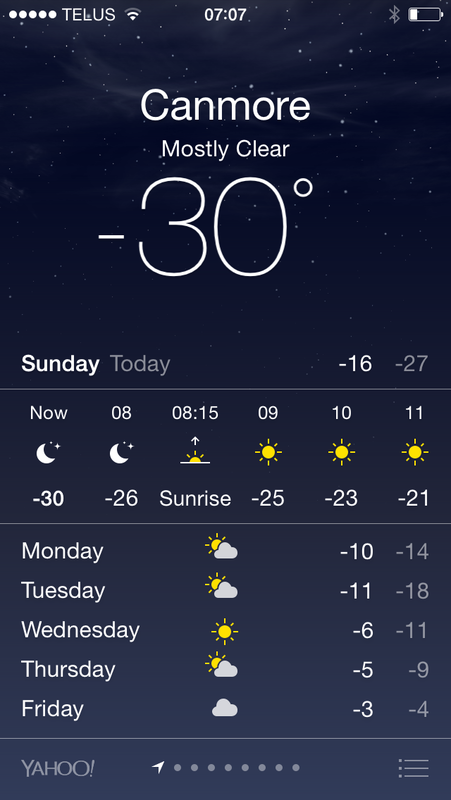 A week or so ago we were in the minus 20s when you factor in the windchill. This week’s been plus 8 and the melting snow has turned the roads and sidewalks into a brown, slippy slushy mess — yet another reason to run on the trails! There’s also something to be said for being the first person to make tracks through fresh snow, even if those tracks occasionally cross those that appear to belong to a cougar. And it’s not mind numbingly boring which cannot always be said about running on a treadmill. But it’s one thing to run in the relatively balmy winter temperatures of New York and Geneva and quite another to run when its minus 20 and below, the ground is covered in snow and ice, and it all looks rather uninviting and even quite treacherous. As Peter Brown Hoffmeister writes in Let Them Be Eaten By Bears (bought for me by Ms. Canmore Runner to help me overcome another of my “only in Canada” concerns): “there is no bad weather, only inappropriate clothing”. I’m inclined to agree and for me that basically comes down to clothes that aren’t sufficiently insulating and protective against the cold and wind; and footwear that isn’t sufficiently grippy on snow and ice. 0 degrees: 2 tops, 1 bottom. Long-sleeve base layer and a vest. Tights (or shorts, for polar bears). -6 to -12: 2 tops, 2 bottoms. A jacket over your base layer, and wind pants over the tights. -12 to -17: 3 tops, 2 bottoms. Two tops and a jacket. Windbrief for the fellas. -17 to -23: 3 tops, 2 bottoms, extra pair of mittens, 1 scarf wrapped around mouth or a balaclava. 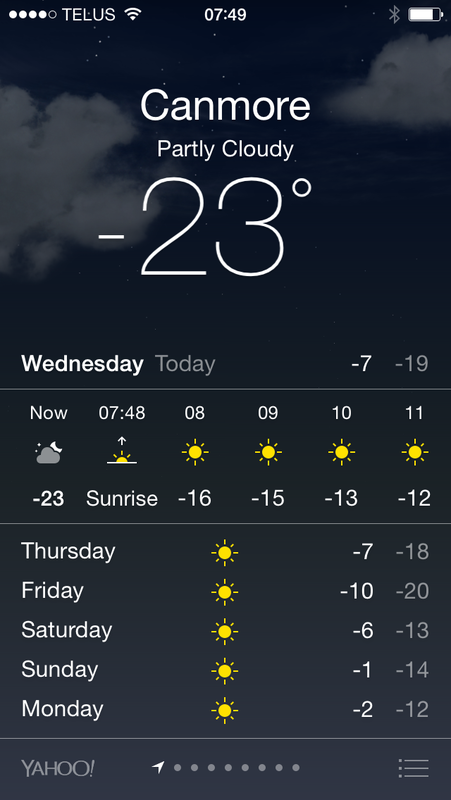 -28 and beyond: 3 tops, 3 bottoms, 2 extra pairs of mittens, 1 balaclava, sunglasses. I’ve found that I tend to wear the same two base layers – a lightweight merino wool layer next to the skin with a fleecy/polar top over that and will then alternate between one of three jackets of different weight and insulation. If it’s zero to minus 10 it’s time for the great Patagonia Windshield running jacket. Minus 10 to minus 20 requires the recently acquired and slightly warmer Salomon Momentum cross country ski jacket. Minus 20 and below calls for the heavier Craft PXC Storm cross-country ski jacket. On my legs I always wear Gore Mythos Windstopper running tights and will also put on merino wool tights underneath for runs below minus 10. I always wear a Smartwool running toque, after all 50% of your heat disappears out of your head, but will opt for the Outdoor Research windproof balaclava when it gets below minus 10. The balaclava’s great for keeping the ears, nose and face warm but I find it hampers my breathing a bit when i’m running up the climbs. I’ve got into the habit of stretching the bottom of the opening down below my chin on those occasions so as to breathe more easily. On my hands, for a couple of years now i’ve relied on the excellent Craft Hybrid Weather Gloves and haven’t felt the need to change, even here in Canmore. They’re thermal gloves but have a wind- and waterproof hood or cover that can be pulled over the fingers converting them into mitts. They also have tactile finger tips that allow me to work my iPhone – at least when it hasn’t shut down because of the cold which seems to be a frequent problem. For my feet, i’m a huge fan of Smartwool PhD running socks which I run in all year round. Faced with the prospect of running in snow and ice, Ms. Canmore Runner very kindly gave me some Salomon Snowcross trail shoes for Christmas. 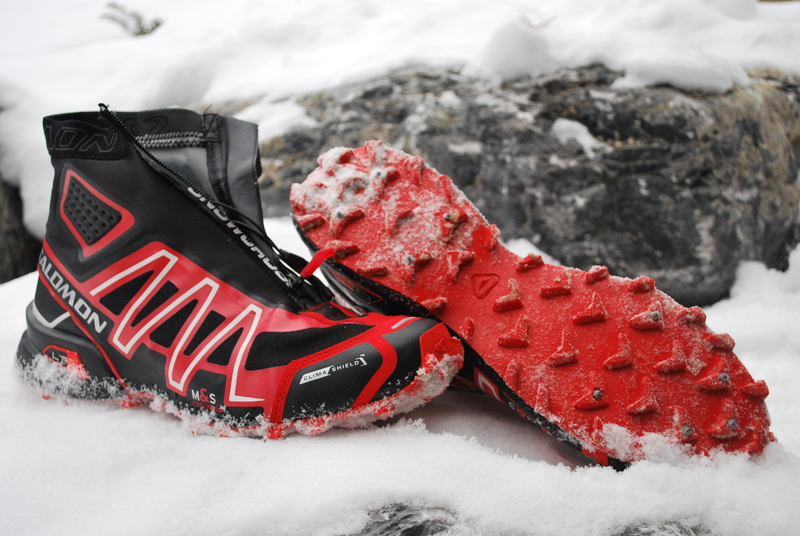 Salomon Snowcross CS – excellent! I love these shoes. They’re based on the Speedcross trail shoe (my shoe of choice since converting from Brooks Cascadia), but have metal spikes in the outsole and a built-in gaiter to keep snow from entering the top of the shoe. They provide amazing traction and, therefore, confidence, especially on soft and hard packed snow. To be sure, they have their limits when the trail is steep and icy but then that possibly applies to most winter trail shoes and traction devices. And of course, they do a great job of keeping my feet warm and dry. Ms. Canmore Runner is a big fan of the Yaktrax: Run which are spikes that attach to her regular trail shoes and which she often combines with some lightweight gaiters. 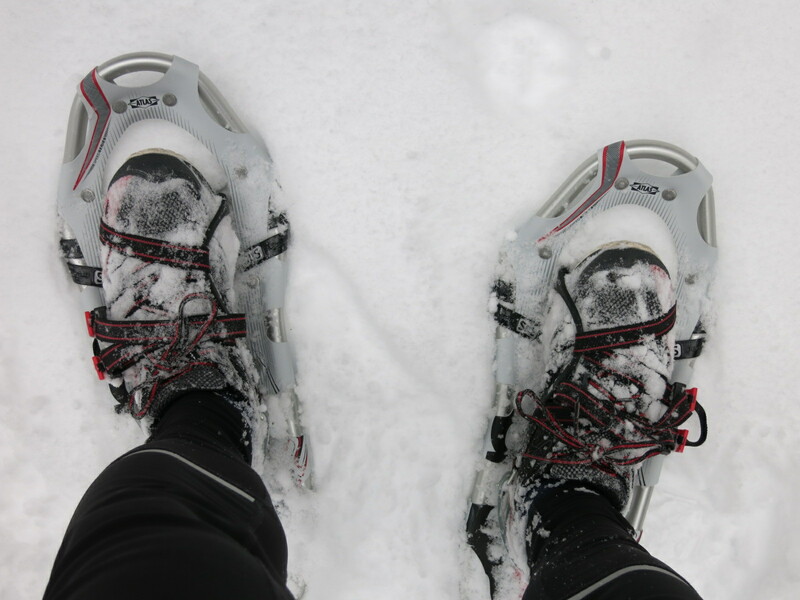 I recently purchased a pair of Atlas Run snowshoes which are great for running in deeper snow. Finally, I also run with a Salomon S-Lab Advanced Skin hydration vest, for carrying water, gels and bear spray (I know, the bears are asleep but now i’m paranoid about cougars) as well as a lightweight survival blanket. This is important as I often run alone and there’s always the risk that I might fall and immobilize myself in some way. Ms. Canmore Runner always knows where i’m running and how long I expect to be, and I always carry a phone (which sometimes conks out), but it could be an hour or two before i’d be found hence the need to carry something to fend off exposure and hypothermia. As I write, the temperature outside appears to have crept up to plus 9 degrees. It’s possibly even raining. I’m confident this is an anomaly and it won’t be too long before the cold and snow return and with them some unique trail running challenges, opportunities and scenery that are to be embraced, enjoyed and most definitely not avoided. Previous Article So, what about those trails? I love your attitude and sense of adventure. Plus the pics here are great. Thanks for reading Bears, and for linking to my site. Dear Peter, thank you for the kind words. Your book is excellent. It’s been a huge help as i try to ensure that my preconceptions and anxieties of the great Canadian outdoors don’t hold me and my family back and we’re truly able to make the most of our surroundings and beyond. I just moved to Canmore and this is the first article I found on winter running. Really well written and a great breakdown! Do you have any favourite running spots you can sugges?